Now that medical marijuana is legal in Massachusetts and licenses have been awarded for the first twenty dispensaries across the state, you'd guess that my practice is busily preparing to meet the demands of patients seeking marijuana prescriptions for several debilitating conditions including chemotherapy-related nausea and AIDS-related weight loss. Since Massachusetts voters approved legalization of marijuana in 2012 I've received no special training (required for physicians to certify patients as eligible for marijuana treatment), been invited to no seminars or lectures, and have little more information than that which the state has provided to my fellow citizens. Marijuana has been used for medicinal purposes for millennia, including by ancient Chinese, Egyptian, and Roman healers. Queen Victoria, famously, was given cannabis to ease her labor pains. Modern proponents of medical marijuana tout its ability to relieve symptoms of a variety of conditions including cancers, HIV infection, hepatitis, glaucoma, and ALS (Lou Gerhig's Disease). Recently, the FDA approved research on a medicinal form of marijuana that shows promise in treating epilepsy in children. Medical marijuana is now legal in twenty states, plus the District of Columbia. Still, many doctors have not embraced the idea of marijuana as a legitimate therapy. A fascinating recent study in the Journal of Family Practice, found that 46% of family physicians in Colorado, where medical marijuana has been legal since 2000 and recreational marijuana is now also legal, believed doctors should not prescribe it. A majority thought marijuana presented health risks, and a minority thought it beneficial. Why is there a disconnect between the voting booth and the exam room, when it comes to medical marijuana? Why is the silence about it in my practice and hospital so deafening? 1) The Massachusetts Medical Society strongly opposed the November, 2012 referendum to legalize medical marijuana and maintained this position even after voters passed the referendum. Citing lack of FDA oversight and concerns about the safety and efficacy of the drug, the Commonwealth's most influential physician organization comes down hard against medical marijuana. 2) The current epidemic of prescription narcotic abuse in the U.S. may make doctors uneasy about prescribing a new psychoactive drug. This is probably illogical, given lack of strong evidence that marijuana, unlike narcotics, is addictive and that marijuana, unlike narcotics, does not cause death by overdose. 3) Marijuana is perceived as alternative medicine. 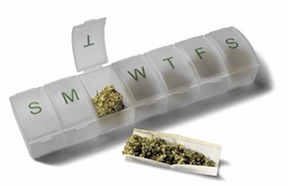 Even though legal, medical marijuana is still out of the medical mainstream. The FDA does not fully regulate marijuana and insurers are not required to pay for marijuana treatment. Some of the newly licensed dispensaries will be operated by integrative health practitioners who provide services such as acupuncture and Reiki, with which are not part of the average M.D. 's practice. 4) Doctors are conservative--not politically, but when it comes to adopting new therapies. I think our very busy schedules combined with our Hippocratic Oath to "to do no harm" often makes us stick with ideas and treatments with which we are familiar and comfortable. I've written, recently, about our reluctance to prescribe FDA approved weight loss drugs and our unease with changing medical guidelines. As more time passes--and more states legalize both medical and recreational marijuana--marijuana may become more integrated into medical practice. In California, which has the longest experience with medical marijuana (it was legalized in 1996), physician certification of patients for marijuana therapy is widespread and marijuana dispensaries are numerous. They're even rated on Yelp. Some In California have expressed concern that medical marijuana is being abused by those who aren't ill, and some feel the claims of abuse are exaggerated. We don't know yet how popular or effectively regulated medical marijuana will be in Massachusetts. What's certain is that, at least for now, patients requesting certification for medical marijuana here may be surprised to find their physicians ill-prepared or reluctant to provide it.